It couldn’t get any clearer – Russia is without a doubt “urging” Syria to “compromise” on a so-called “political solution” to its long-running crisis, and to do so as soon as possible in order to avoid a larger Mideast war. 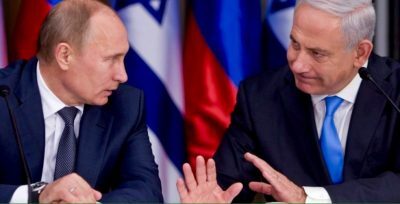 The groundbreaking Putin-Netanyahu Summit that took place a couple of days ago in Moscow on Victory Day was bookended by two back-to-back “Israeli” bombings of Syria within a 24 hour period, all of which was followed by Russia reportedly declining to sell S-300s to Syria. There’s no other way to analyze this than to see it for what it truly is, which is Russia utilizing various means to “urge” Syria to “compromise” on its hitherto recalcitrant position in refusing to make tangible progress in adapting the 2017 Russian-written “draft constitution” for “decentralization” (and possibly even “federalization”) and “complying” with Moscow and others’ “request” that it initiate the “phased withdrawal” of Iran’s elite Islamic Revolutionary Guard Corps (IRGC) and their Hezbollah allies from the Arab Republic. The gist of all of this is that Russia’s excellent relations with “Israel” are part of its envisioned hemispheric “balancing” act in deterring its many diverse and in some cases rivalling partners (such as “Israel” and Iran) from resorting to military means to settle their disputes and to instead rely on Russian-mediated diplomatic efforts to broker a “political solution”, whether openly or clandestinely through “gentlemen’s agreements”. In the Syrian context – whether one thinks it’s “morally/ethically” right, wrong, or feels indifferent towards it – Russia has determined that the “Israeli”-Iranian proxy war will continue to escalate so long as Damascus allows the IRGC and Hezbollah to retain their military presence in the Arab Republic after the defeat of Daesh, the latter event of which should have served as the trigger for allowing those two a “dignified” and “phased” withdrawal from the country but ultimately didn’t because of Damascus’ desire to play off Tehran and Moscow in a bid to reap strategic benefits from both. In addition, there are also very serious matters of national pride when it comes to Syria’s relationship with its Iranian and Hezbollah Resistance allies, both of whom proved themselves as the country’s most loyal partners in the military and ideological senses. It’s all but politically impossible for President Assad to “comply” with what is quickly becoming the “international community’s” informal “request” for him to ‘compromise” on his country’s ties with these two because his domestic base might be tempted to perceive this (whether rightly or wrongly) as “selling out” and having fought this war “for nothing” since these terms were present from the very beginning of the conflict. The Syrian government refused to remove both of them from the country over seven years ago as a “compromise” for preempting what has since turned out to be one of the worst wars of this century so far, so it’s unlikely that it will do so now no matter how much “pressure” is put upon it, including from its Russian partners.